As far as completed projects, I need to renew my efforts to find a home for ASTRONAUT DAD and HOW TO LOSE BIG. In regards to ASTRONAUT DAD, it's frustrating for a beautiful 160 page graphic novel to be completely finished and yet unread. Also, HOW TO LOSE BIG is such a great story. The proposal looks great. We just need to find it a home. With ongoing projects, I'm focusing all my energy on WE'VE NEVER MET, which resides on the back inside page of the free weekly entertainment newspaper Quick. On a professional and creative level, it's everything I could ever hope for. It's consistent, paying work where I get to develop a continuity and collaborate with a talented artist. We have a massive local readership (Quick reaches more than 90,000 per week), and the potential for a huge fanbase. Story wise, I love the slice-of-life feel of WE'VE NEVER MET. It's a story about a person's life, an adventure in searching for meaningful relationships and pursuing artistic goals. It doesn't have to be a "gag comic" nor does it need super heroes, monsters, robots, zombies, pirates, or ninjas. Although, it does have one hobo. ANNOUNCEMENT #1: As of this month, WE'VE NEVER MET is now weekly. It's no longer on an every other week cycle. This will give us a much better opportunity to build our audience. That's 52 pages every year. Unfortunately, it does end the regular appearance of LISTOONS (click here), created by my friends Geoff and Cal, with whom we alternated on that back page. LISTOONS isn't gone. There should be periodic appearances elsewhere in the pages of Quick. In the next few weeks, Liz (our protagonist) will be in the studio recording an EP. We will introduce a new character, Lindsay Graham from Junius Recording Co. Liz's last name will finally be revealed, as well as the band's name. Exclusive preview: The band name is Inklings. ANNOUNCEMENT #2: Speaking of Inklings, music producer Lindsay Graham and I are entering the bold terrain of fictitious bands -- Gorillaz, Josie & the Pussycats, Partridge Family, Monkees, The Oneders, etc. We're still in the early stages of everything, but you can expect to actually hear Liz's band. You'll be able to buy the album, proudly wear an Inklings t-shirt, request them on KXT, or vote for them in the Observer Music Awards. Who knows where it will all lead? I'm proud to be working with Lindsay, and I can already tell this is going to be an exciting experiment. Inklings are my new favorite band. 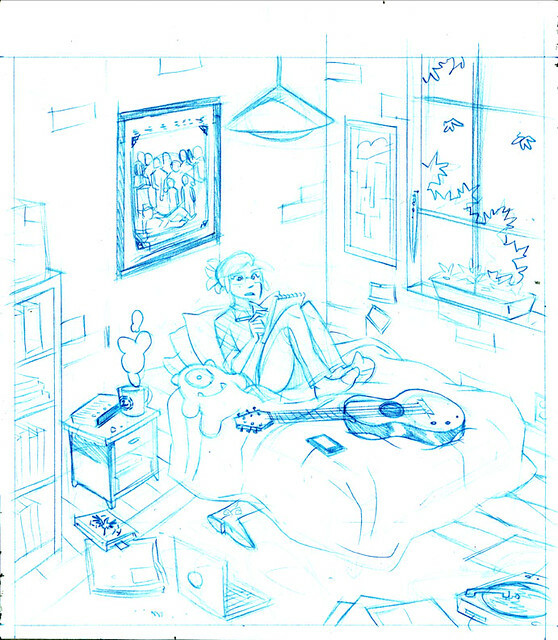 But first, Liz has to write some more songs (below: a preview of the October 14th comic). My other goal in the "ongoing projects" category, unrelated to WE'VE NEVER MET, is to try to write at least two features for D Magazine every year. And guess what? ANNOUNCEMENT #3: I just signed a contract for my first magazine feature (2,000 words). I don't want to go into any further details. Let's wait until the story is sent to my editor, and then off to the printers. With new projects (and this is a difficult issue), I'm going to work on only one new graphic novel proposal at a time. Jamar Nicholas and I have our BULLETPROOF WEST project. That's the one. Nothing else until that's complete. I know I've mentioned this idea before, but it's new because all we have is a plot outline and some characters. I'll have more details soon. With abandoned projects, unfortunately, there are too many to name: FRONTIER, BOLIVAR, OMISOKA BRIDGE, JACK RUBY, KARMA INC 2. Better not to think about it. With loose ends, Paul and I are working on the finale for SOUVENIR OF DALLAS to appear on D Magazine's Frontburner blog. Also, Brock and I have a short Emily Edison side project that I need to script this week. And that's the update. Sound good? Let me know your thoughts.